~ by Tammy on May 11, 2011. Nice macroshot. I like the lights, the tones and color. Clarity is right also. It sticks out from the image. Just a hint of the color of this peony. My Mom’s and nana’s favorite flower cause they were in bloom on her birthday in June (massachusetts). Creative fulfillment of the theme as well as perfect macro! Beautiful shot! Looks like it’s going to be pink. Have a great day! A new way to look at flowers! Now that is thinking outside of the box. Great take on the theme, and so wonderfully captured. Tammy, this is just a gorgeous shot. I love that the light is just illuminating the pink. You did great! Simply beautiful Tammy, the color and shading is awesome!! Warn the Guards, there is about to be a breakout! The lighting is superb and it is like an alien life form before us! The dark soft colors make me think of a Victorian tapestry. I think you caught it in its orb phase just in time! My favourite 🙂 I love peonys! The light is so wonderful in this. 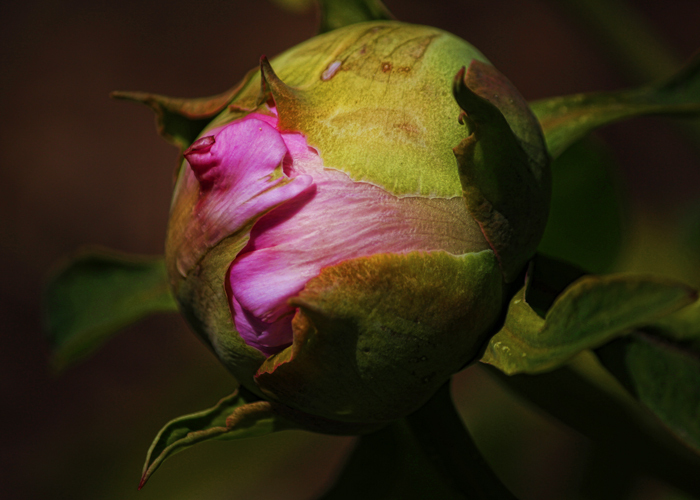 Peonies are such divas, this seems to be saying that it’s ready for its close up! No ants either, a folk tale but I was told as a kid that the ants had to massage open the flowers. This is awesome! Do you know what kind of flower it is?